No one was surprised when Gears of War went on to sell truckloads of copies. It looked good, it was made by a tried and trusted team, and most of all, it was the most visceral action game consoles have ever seen. If you had testosterone in your body, Gears of War was likely an enjoyable treat. So obviously no one should be surprised that Gears of War 2 is arguably the second most-hyped game release of the year. (I’d put Metal Gear Solid 4 slightly ahead of it.) TV spots, viral marketing, constant talk of the upcoming movie; Microsoft’s doing all they can to make people want to pick up and play Marcus and Dom’s latest epic adventure. That really is the only way to describe the overall feeling when playing Gears of War 2: epic. Gigantic, open areas; caverns teeming with life on all sides; sunken cities; the Locust stronghold. Every act in the Gears 2 campaign has more detail, and more breathtaking vistas and scenes than Gears 1 ever offered. Gears of War 2 begins half a year after the detonation of the Lightmass Bomb at the end of the first game. While the bomb succeeded in wiping out a large portion of the Locust horde, much of their population remained, and the bomb’s ignition combined with the liquid Imulsion underground creating a poisonous gas which has crippled many of the COG forces. Both sides are undermanned, and ready for one last desperate strike to end the war. For the Locust, that strike comes in the form of city sinking. The human cities of Tollen and Montevado have collapsed into giant sinkholes, and while COG knows the Locust are responsible, no one knows why. Once the Locust assault the formerly safe haven of the Jacinto Plateau and it shows signs of structural collapse, the forces in charge decide to send their remaining soldiers on the offensive. For the first time, COG is taking the fight to the Locust’s realm. Obviously, Delta squad is one of the groups sent on the mission. Marcus and Dom team up with Tai Kaliso—a big, tattooed man with a spiritual side—and Carmine—the younger brother of Anthony Carmine, who died in the first title. Their mission is to make their way underground, figure out how the Locust are sinking the cities, and then find a way to wipe them out for good. It’s after the initial defense of Jacinto Plateau that Gears 2 begins to kick it up a notch above its predecessor. From the ride in gigantic vehicles to the subterranean launch point, each area the campaign progresses through is meticulously detailed, and far beyond what other games accomplish. Even if you don’t care for the gameplay or violence in the Gears of War franchise, it’s impossible to deny that watching the action on the screen is like watching an epic Hollywood film unfold. The presentation and visual wonderment of the game makes Gears of War 2 the Xbox 360’s first answer to the PS3’s until-now dominance when it comes to cinematic presentation. Unfortunately, while the game feels and looks epic throughout the first half of the title, the narrative cannot keep this pace in the second half. We all knew the Gears story would continue past this game; anyone who thought this was it obviously hasn’t read anything about the franchise until now. Still, I was hoping for more resolution with the issues presented in Gears of War 2. Instead, the game wraps up with several unanswered elements (including some which are added in the last 5 minutes of the game), and even more uncertainties. While the game wraps up on aspect of the 10+ hour tale quite neatly, the other six or seven are left hanging for the sequel(s) to pick up. The result is an end much like Halo 2’s—cut off so abruptly with so much left unanswered you can’t help but feel cheated by the finale. The ride is fantastic, but it feels a lot like you rode the log all the way to the top of Splash Mountain only to be told by the operator that the drop was closed until they finished reconstruction next year, so you have to get off now and then walk down the stairs instead. What doesn’t help is that the final boss fight is much more of a visual wow than a gameplay one. What kind of final boss takes about 20 seconds to beat, and offers almost no risk of death? This one. For multi-console gamers who are trying to decide between this and Resistance 2, the lack of epic, gigantic bosses in Gears 2 will certainly be something to consider. My other main gripe with the latter half of the story is the vanishing act Dom and the other supporting cast members seem to pull, as Marcus becomes the main guy. For most of the first portions of the game, Dom is finally given the treatment he deserves, and his story is arguably the focal point of a good three or four hour chunk of game. Then, once it wraps up, it’s back to Marcus mode. I don’t mind Marcus being the focus at all—he is the main character—but the switch to a Dom-centric story just makes it more obvious that there could have been so much more depth to the tale of the Delta Squad, and it makes me wonder how different it would have been if we saw more of that side of the coin. Even though I have my issues with the way Gears 2 ends and the turns the story takes halfway, the game is still incredibly fun to play-especially with a friend, which I’m sure is what most people are glad to hear. Co-op in general has gotten a tweak in the form of individual difficulties, which will give more experienced gamers a bigger challenge while letting their inexperienced friends play alongside them. A drop-in/out feature should also make playing with other people easier than ever. While the online co-op is great (as expected), the online multiplayer still suffers from the same issues as its predecessor. Point blank shots will miss, people will get chainsawed from two meters away, and there’s always the chance that to hit a moving opponent, you’ll need to shoot where he’s going to end up, not where he is. On the bright side, the shotgun’s effectiveness has been tweaked to a more balanced level, so you’ll run into far less shotty-only players. Epic’s new netcode certainly decreases the frequency of host advantage overall, and the aforementioned issues are less noticeable than they were in Gears of War, but they still persist making story the same as it was with the first game: it’s loads of fun when everything is working at an optimal level, and frustrating as hell when they aren’t. If you gave up on Gears 1’s multiplayer and had hopes of 2 fixing all that was wrong with it, I’m sorry to say that it doesn’t. Are the issues better? Yes. Fixed? Not by a long shot. Thankfully, you don’t have to go online to have multiplayer fun with the inclusion of bots and the Horde mode. While plenty of other games have promised bots utilizing player-like AI and ultimately failed to deliver, in Gears of War 2 that promise is fulfilled. Just seeing the enemy AI in the campaign mode on the higher difficulties should show you how great the AI’s programming is, and the multiplayer bots are no exception. You’ll see flanking, diversions, and all sorts of tactics which are usually reserved for human players. You could even argue that the AI of the bots is more intelligent than the average Xbox Live player. The Horde mode is the other great multiplayer addition which makes up for the frustrating host advantage in online play. The idea is simple: take some players, and pit them against a never-ending onslaught of increasingly difficult Locust forces. It’s essentially Tower Defense with the Gears of War 2 engine. The action scales up nicely, and once your wave of enemies count rises, things get hard fast. It’s addictive, fun, and a great way to enjoy the game with friends once you’ve already beaten the campaign mode and unlocked all there is to get on that. 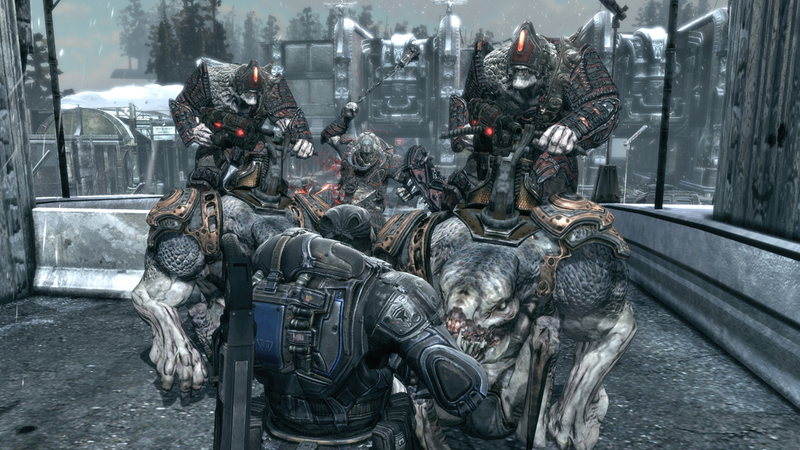 In the end, Gears of War 2 is similar to Gears of War, but features some noticeable improvements and additions. The enemy AI is more intelligent, the environments are better designed, the overall presentation is much more epic and cinematic, and Horde mode is one of the most deceptively fun multiplayer modes on the market. Unfortunately, the game suffers from Halo 2 syndrome where the ending is lackluster at best due to the obvious conclusion(s) of major story points being saved for the next title(s). Don’t let that put you off, though, because just like Halo 2, Gears of War 2 manages to conquer that and remain a fun, entertaining, and overall memorable game which will be loved and played by fans for years to come, despite its shortcomings.